Who doesn’t like mood lighting? It’s a good way to help set a mood, or just relax with a nice hot shower and nothing but a soft glow to detract from it, in the case of these beauties. Some are even utilitarian, and I’m going to narrow down the best ones I can find on this list today (and tell you how I picked them). Fun, practical, all in one shiny package! This is sort of the quintessential LED shower head, the kind of thing everybody probably thinks of immediately when they hear the name. It’s a traditional product, with some lights on it. Easy peasy. Still, that’s a plus, not a downside. It’s a great product to start. Five settings: power rain, economy rain (translate these two to “full body spray” and “water saver”), massage, mist, and one of my favorites in the pause feature. A good suite of options rounded out by the construction, being made of high grade ABS plastic with a nice looking (if simple) chrome finish, backed up by a limited lifetime warranty. The LEDs come in three colors: blue, green, and red and are powered by the flow of water. The lights automatically change according to the water temperature, making it a great guideline for testing the temperature with your and before you get in (or put one of your kids in) the shower, though not a replacement for that direct test. The LEDs will glow a cool blue under 95 degrees, switch to green at 95 degrees until 108 degrees, and at 109 degrees and above will turn red. The red will flash a bright “WARNING” if the temperature exceeds 122 degrees (at that point, I’d suggest you check up on your water heater). And the best part is that it’s under $40, meaning you won’t need to break the bank to outfit all your bathrooms if you want! A great rainfall product combined with soft LEDs. This 16 inch square shower head boasts an enormous 289 water nozzles, making for a very thick rain. That alone makes it a very good rainfall unit, but the LEDs that judge temperature (similar to our winner: blue for cool, green for warm, and red for hot) make it both a mood lighter and somewhat utilitarian object. It’s made of solid, sturdy materials: stainless steel with a “rubbed bronze” finish (though looks black save in the most specific of lightings when you can see the bronze coloring seep through at the edges) and silicone touch clean nozzles. I like this one a lot, though its price is equal to its quality: this one will cost you a bit over $100 in most cases. 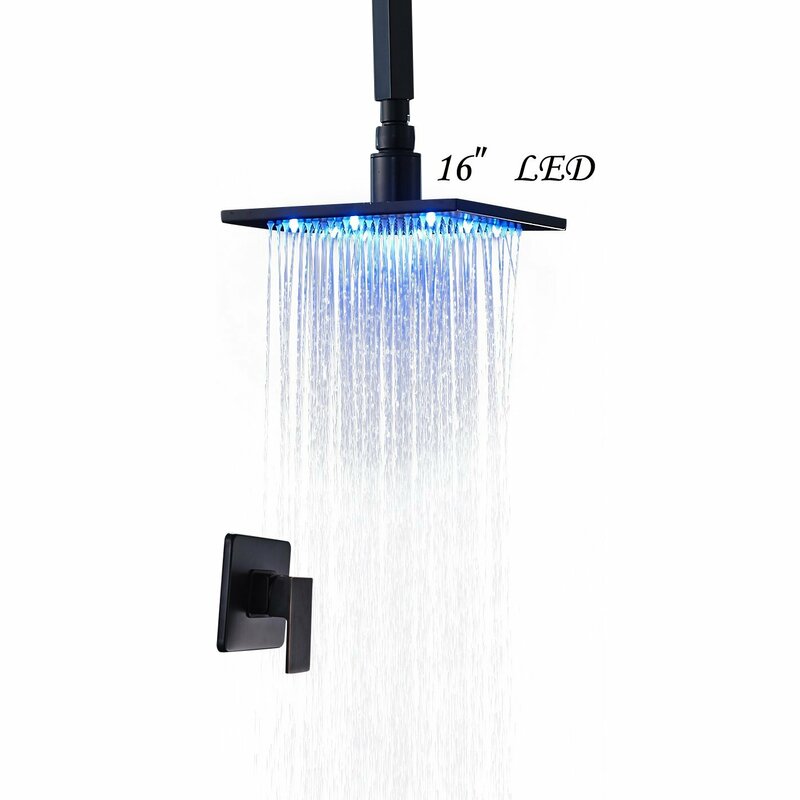 That’s honestly not too bad for something I’d call the ultimate LED rainfall shower head around; there is at least one around that’s nearly identical but far more expensive (like, 5 times more…). A rainbow of colors to choose from. 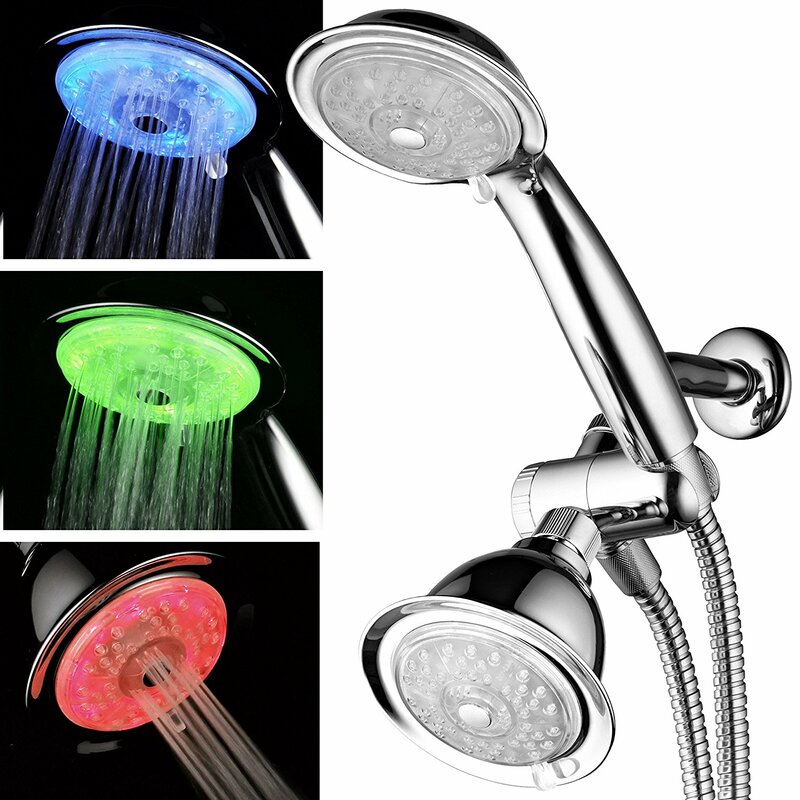 The most pretty of the LED shower heads we’ll look at today (in my opinion). 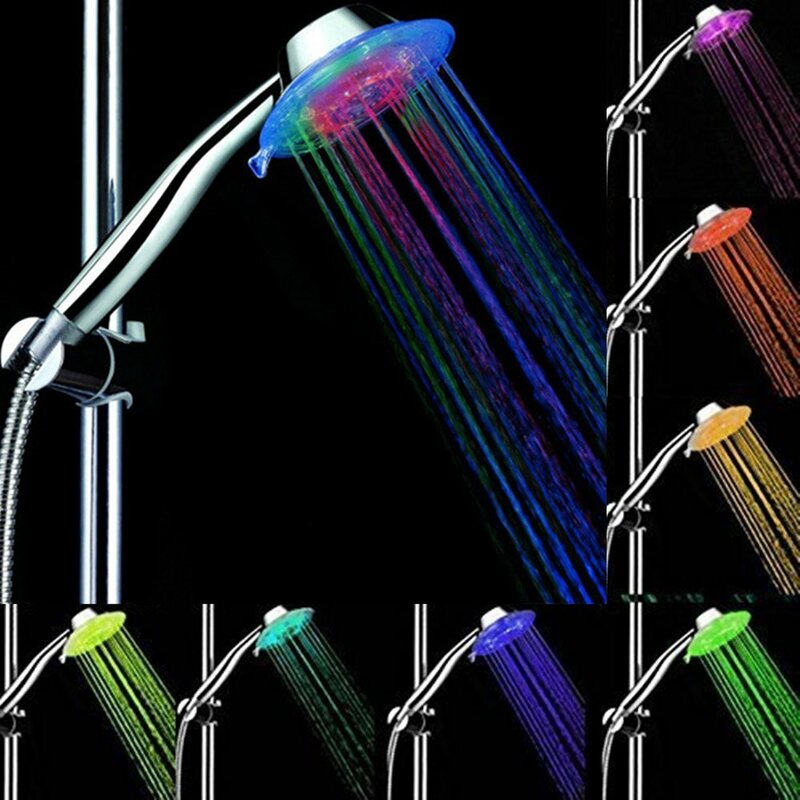 Rather than changing color based on temperature, the PISSION is a rainbow LED shower head, allowing you to have any color of the rainbow, or a mix. Of all of the ones we’ve looked at so far it also has the strongest lighting, illuminating far more of the streams than any of its rivals. The product itself is a simple three setting unit, made of ABS plastic with a simple chrome plating, but that’s to be expected for an under $20 product. My only real gripe is that you can’t control the colors; they cycle through the variations automatically. It’s not a huge deal, but not being able to pick your favorite color to roll with is a slight downside I can’t overlook. A solid combo and LED. This one combines two gimmicks into one! Okay, maybe a bit harsher than I intended. I’m not a huge fan of combo or dual shower heads most of the time. Not that I think they’re bad, but that they’re generally more awkward than simply having a normal shower head and a handheld that is somewhere a bit more out of the way than directly on top of your fixed shower head. Still, this one boasts 24 settings (though, really, more like 6- it loses a few points for counting not only combinations of existing settings but combos of the same setting across the two faces), is made of high grade ABS plastic, looks pretty good, has the temperature gauging LEDs, and is under $100. Not too bad, and it will even boost your water pressure for you as an extra (always a plus in my book). The most simplistic option here, but also the cheapest (well under $20), I find this one to be pretty good for someone who wants (or needs) to save both water and power at the same time. It has some pressure boosting function, and you can shower in the dark! It boasts being able to filter out more impurities and heavy metals in the water with its “negative ion balls”, though I haven’t found anyone to attest to that ability. Still, even without that it’s made of durable materials, it’s small (so it travels well), it’s cheap, and changes colors depending on the temperature. It’s the bare minimum of what you expect from a shower head like this at worst, and that’s not too bad. There’s a bunch of good options here at every point on the list, and it depends somewhat on your preference. If you like greens and reds the most, the Dream Spa and Rozin offerings are going to be by far your greatest bets. The PISSION shouldn’t be overlooked for its color wheel changing LED showerhead if you want an LED sower head for pure aesthetics, though. Still, the top quality LED is far and away the Dream Spa or Rozin if you prefer rainfall showerheads, so I’d suggest going with those unless you have kids you really want the lights for (since they won’t tend to use the alternate settings as much anyway). How about taking a look at some other choices available? The main three things I look for are: construction, price, and function. 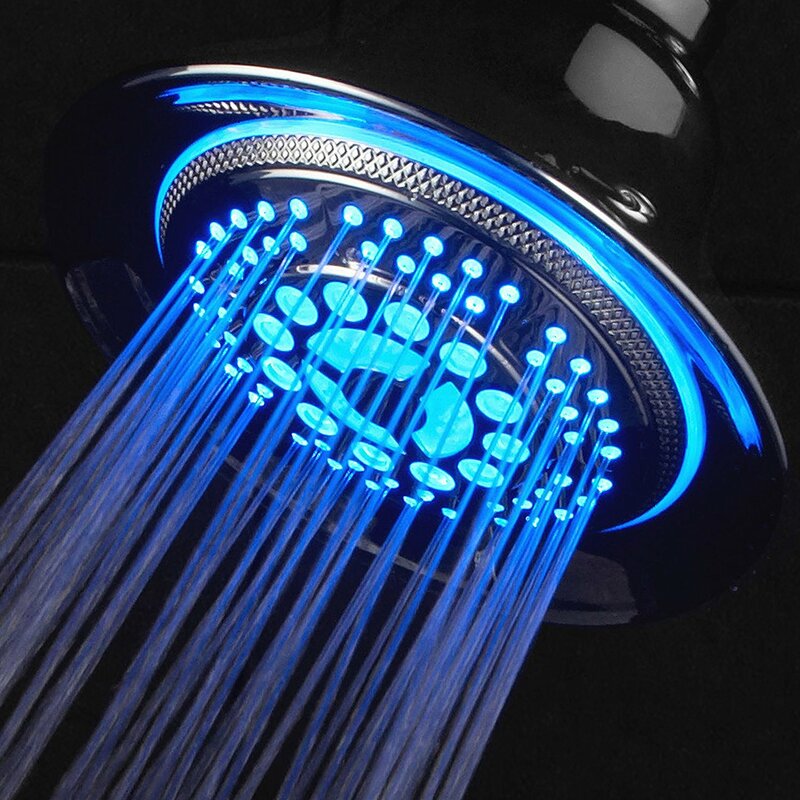 One thing you should remember when buying an LED shower head: you still need to make sure it’s a good product. That means it should be constructed of at the least stainless steel or high quality plastics (or sometimes bronze), and have clog resistant nozzles (usually plastic or rubber, sometimes silicone, and should always be able to be cleaned by simply rubbing them). Being a bit of a novelty or luxury item doesn’t let it off the look for also being good at its primary function. Today we’re looking at around $100 or less, some even costing under $20. There’s one good LED rainfall shower head I left off that cost nearly $500 (I didn’t feel it was worth the price), and the rest are in a far more affordable range of prices. 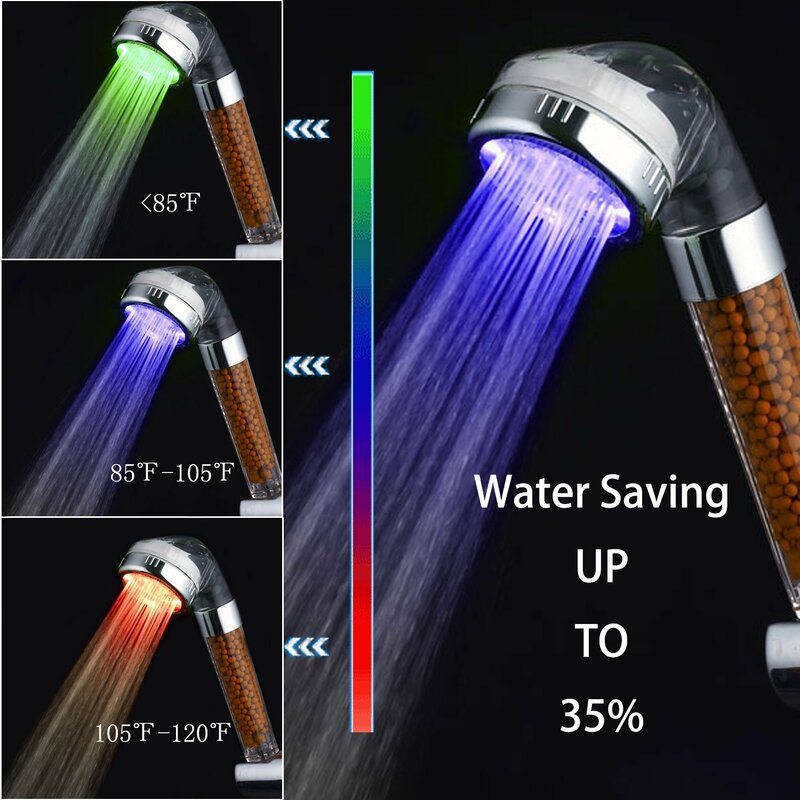 Like I said a little earlier, a LED shower head should first and foremost also be a good unit. That means it should either have one function and do it well (like a rainfall shower head) or if it is a multiple setting traditional unit, it should have at least the basic three I expect from any product: a jet, massage, and normal full body spray. Fairly lenient criteria I think, but you’d be surprised how many LED shower heads try to coast on simply being as basic as possible of a unit but with lights slapped on and a jacked up price. I also give bonus points for the product being self powered, as most are. Most LED shower heads are powered by the water running through the unit spinning a little turbine, and now powered by outside sources. This is the preference.